MILPITAS, CA--(Marketwired - February 17, 2016) - ESS Technology, a leader in audio and analog design, today introduced the highest performing audio subsystem available for smartphones and other mobile applications. The ES9118 SABRE HiFi System-On-Chip (SoC), with integrated DAC, headphone amplifier and output switch, leverages the company's patented 32-bit Hyperstream architecture to deliver up to 126dB Signal-to-Noise Ratio (SNR) and -113dB Total Harmonic Distortion plus Noise (THD+N) of audiophile quality audio all the way to the headphones. These unprecedented performance levels for mobile devices makes the highly integrated ES9118 SABRE HiFi SoC the perfect choice for true audiophile experiences that were previously only available with large, expensive home theater components. The first public demonstration of the ES9118 SABRE HiFi SoC will be at Mobile World Congress in Barcelona from February 22-24 in the ESS space in Hall 2, meeting room 2C6 in the Fira Gran Via. "Recent studies have shown that upwards 67% of people accessing music are doing it from their smartphone, with at least 38% listening through headphones and 43% saying the highest quality sound format is important," said Dan Christman, Chief Marketing Officer for ESS. "With the phone becoming the primary music source, smartphone manufacturers need to address the increasing demand for higher quality audio. That is exactly the challenge we are solving with the ES9118 SABRE HiFi SoC." The ES9118 supports the industry's most popular high resolution and lossless audio formats including FLAC, ALAC, AIFF and WAV. It also completely supports compressed legacy formats so the consumer is assured that they will have the best listening experience possible. 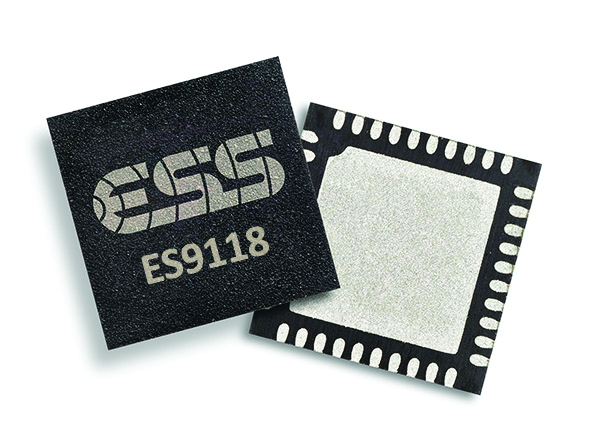 By integrating SABRE building blocks including the DAC, headphone amplifier, feedback resistors, output switch and low-noise DAC reference into a single package, the ES9118 also reduces the amount of board space used by the audio subsystem enabling ever-shrinking, slimmer phone formats demanded by today's consumers. The ES9118 SABRE HiFi SoC is a 32-bit, 2-channel audio digital to analog converter integrated with headphone amplifier and output switch designed for audiophile-grade applications in an easy-to-use 40-CSP or 40-QFN package, delivering up to 126dB SNR and –113dB THD+N using the ESS patented 32-bit HyperStream® DAC architecture and Time Domain Jitter Eliminator. The ES9118's integrated DAC supports up to 32-bit 384kHz PCM and DSD256 data in master or slave timing modes. A fully programmable FIR filter with eight presets provides a customizable sound signature and the ES9118's integrated headphone amp supports up to 1.1Vrms output with analog volume control to reduce output noise at real-life listening levels. The patented, integrated output switch allows non-HiFi sources, such as speech, to bypass the ES9118 to minimize power consumption. Residual distortion from suboptimal PCB components and layout can be minimized using ES9118's unique THD compensation circuit, while PCB footprint and bill-of-materials are minimized by the integrated feedback resistors and low-noise DAC reference LDO. According to a Music Watch Inc. recent study on the potential for high resolution music.